VdB 134 is a reflection nebula visible in the constellation of Cygnus. The nebula reflects the light of the star ω1 Cygni, a blue subgiant of spectral class B2.5IV having apparent magnitude 4.93. 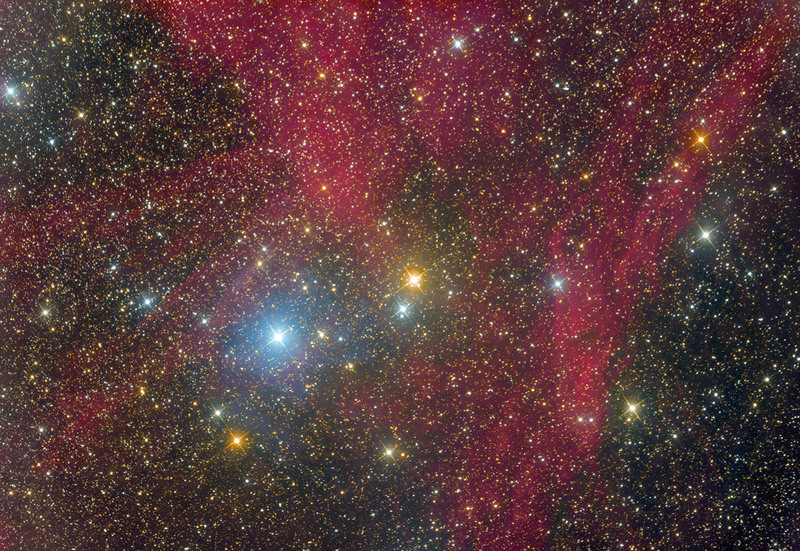 Its distance, measured by parallax, is about 267 parsecs (869 light years), therefore well in the foreground compared to the great nebulous systems of Sh2-109 and IC 1318 visible in this direction. ω1 Cygni is also a variable star of the Beta Cephei type, whose very slight oscillations are included in just 0.03 magnitudes, with a period of 1.113 days. Above VdB 134 can be spotted the very faint circular planetary nebula PLN 86+5 1 (see mouseover). Exp. Details: L:6x10min., R:5x10 min, G:5x10 min, B:5x10 min, Bin 2, Total Exposure Time - 210 min (3h 30min).